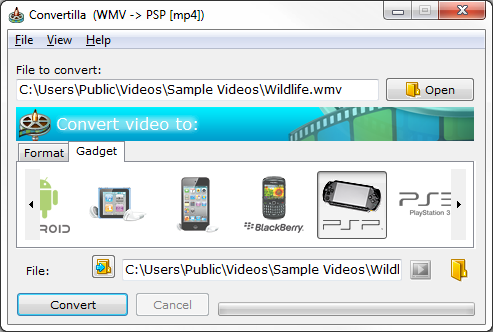 Convertilla is a simple and convenient program for converting video and music files between various formats. It supports MP4, FLV, MKV, MPG, AVI, MOV, WMV, M4V, 3GP, MP3, WEBM, OPUS, AAC, FLAC, APE, WAV. We prepared presets for the following devices: iPhone, iPad, Android, iPod, Blackberry, Sony PSP and PS3, Microsoft XBOX 360 and Zune, Nokia N-series and others. Convertilla integrates with Internet Download Accelerator helping you to conveniently convert video to the desired format right after you finished downloading a video file. For example, you can convert video downloaded from YouTube to the format supported by your mobile phone.